With a few last bell peppers still camping out in the summer garden, I snagged them all up this past weekend before they went to the ground. Initially planning on throwing them in with some other veggies and doing a veggie roast, I decided instead to do something more creative: Stuffed peppers. I packed the peppers with iron-rich bulgur wheat, threw in a few herbs and a fresh chili for a kick of heat, and then ended up adding some soy crumbles at the last minute for a boost of protein. If you’re not a fan of soy protein, try tossing in beans, chopped nuts, or a combination of the two instead. Carrying with it both a lightness of summer and a heartiness suited for fall, this was the perfect meal to end a slightly cool, late October day. Feel free to top the peppers with cheese (such as parmesan or feta) for an extra element of flavor, or keep it vegan like I often prefer to do. Directions: Bring large pot of water to a boil. Meanwhile, slice top off of peppers, and discard seeds and membranes. Chop excess pepper remaining around tops, and set aside. Submerge peppers in boiling water and cook for 5 minutes. Remove and set aside, saving 1 cup of water used for boiling peppers. Preheat oven 350F. Heat olive oil in large saucepan over medium-high heat. Saute onion, garlic, bell pepper, and chili pepper 6-8 minutes, until tender. Add basil and bulgur, salt and pepper, to taste, and cook an additional minute. Stir in tomatoes and one cup of pepper water. Cook for 10 minutes. Add soy crumbles, and cook an additional 5 minutes. Stir in parsley and remove from heat. Adjust salt and pepper, to taste. Place peppers in a lightly greased baking dish. Use a spoon to stuff peppers with bulgur mixture. Lightly drizzle olive oil over top. Cover with aluminum foil, and place in oven. Bake 30 minutes, or until fork tender. Remove cover and bake an additional 5 minutes. Remove from oven. Let sit for at least 5 minutes. Sprinkle with chopped parsley, and serve. I haven’t made stuffed peppers in a long time (actually, I haven’t stuffed anything in a long time…). They look delicious! Yum! What a great fall dish. I have been thinking of stuffing peppers, but I just couldn’t decide with what…and I think now I have my answer. These look great. This is so great! 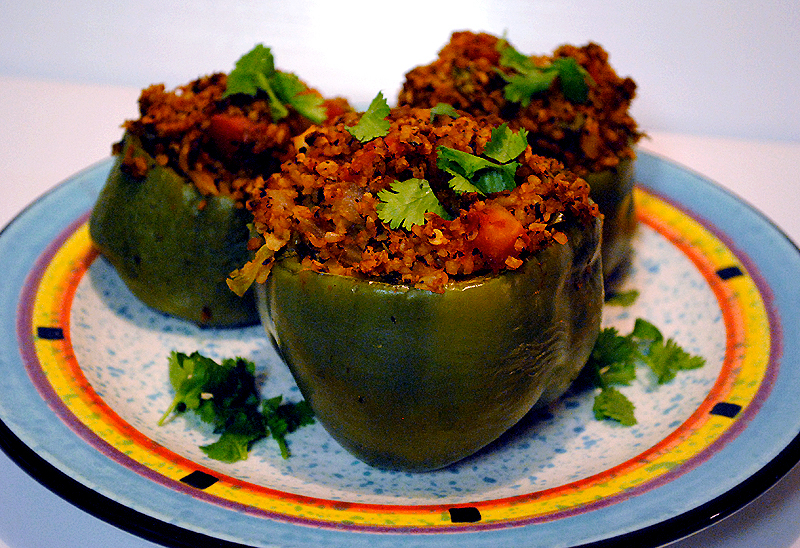 I love stuffed peppers..having the bulgar wheat as the stuffing is such nice twist. Gonna try this soon.